Three Cities Group is delighted to be expanding its reputed management and marketing services into East Africa, with the recent acquisition of the Zanzibar Beach Resort in one of East Africa�s largest countries and the Kunduchi Beach Hotel and Resort in Dar es Salaam, Tanzania. Three Cities Group Managing Director, John Creighton said that the quality of Three Cities operational standards and services are well known in Southern Africa. The management and marketing ability of the Group were the reasons why hotels in Tanzania and Zanzibar chose the Three Cities Group over other Hotel operators. �We are very excited to add both these hotels into our portfolio and to be expanding our footprint into East Africa. 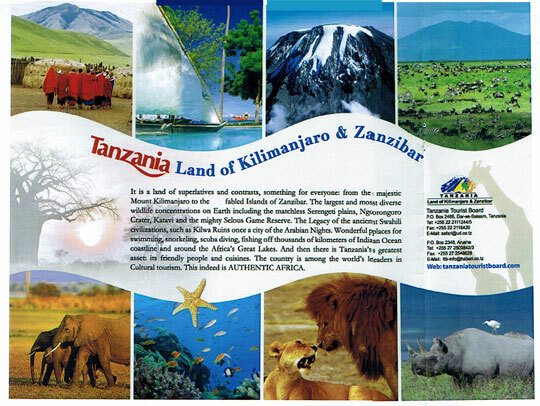 We intend to expand further into Tanzania and further across the region. This brings to date, four other African countries outside of South Africa that the Three Cities Group operates in". Creighton further explained that with the recent appointment of three Goodwill Ambassadors to promote tourism to Tanzania in the United States, he was keen on the Group taking pride and centre in its offerings to international visitors. Both Resorts sit on the lap of the beautiful Indian Ocean boasting flawless white sandy beaches and waves breaking over coral reefs and sand bars offshore - perfect for the ultimate, sun-kissed African get-away. The soon to be refurbished Zanzibar Beach Resort is situated on the south-west coast of Zanzibar, only 10 minutes from the historic exotic SwahiliStone Town and five minutes from the International Airport. The Resort is set in a magical hand-picked stunning location with gorgeous landscaped gardens. At Zanzibar Beach Resort it is guaranteed that guests will spend most of their time around the swimming pool due to its magnificent size, elegance and scenery. sunsets and catch cooling sea breezes. The spacious rooms all have air conditioning, colour television with satellite channels, high bandwidth internet, mini bar and Tea/ Coffee making facilities. The Resort also features well -appointed Conferencing facilities (seating up to 1 200) that provide a variety of fully air conditioned meeting venues all with natural day light. The Kunduchi Beach Hotel and Resort is built in a stunning Afro-Arabic design with all the splendour of a Sultan�s Palace overlooking the pristine white sands of Kunduchi Beach. Situated just 18km from Dar es Salaam International Airport and 21km from the city centre, the Resort features one of Dar es Salaam�s top 10 attractions and the biggest water theme park in East and Central Africa, Wet n Wild. The theme park boasts 27 slides and seven swimming pools, together with water polo facilities; great fast food outlets and dedicated children�s game area among other offerings. The Resort has 138 sea-facing rooms (including 10 deluxe Jacuzzi suites) and 48 Apartments, each having its own private balcony with sliding glass doors that open to the beach front. With a fully functional Go Kart and Quad Bike Track and Sea Sports Centre to cater for all water adventures from jet skiing and hover crafts to wind surfing and deep sea diving and fishing. There are also four Conference facilities (seating up to 1 500) to choose from, which come with the necessary support systems and services. Three Cities Management was formed in 1988 as a hospitality group offering specialised services in the tourism industry. Today The Three Cities Group manages and markets over 32 quality tourism and leisure properties and has a strong network of sales and marketing specialists working out of Johannesburg, Durban, Cape Town, United Kingdom and Germany. Its distinctively unique portfolio of properties includes Exceptional Hotels and Exceptional Safari Lodges as well as three campuses of The International Hotel School (IHS). The Three Cities Group was also instrumental in the conceptualization and management for 10 years of the largest Marine Theme Park in Africa � uShaka Marine World in Durban. Its unique portfolio of properties offers a diverse range of Africa�s finest hotels, resorts and game lodges situated in the major tourist and business centres of Africa. African Travel creates personalized African safaris and adventures for today's travelers seeking an experience of a lifetime. Established for over 35 years, and with more than 100,000 past travelers, African Travel knows all the different ways to safari and how to match each individual client to their own unique experience. Whether experiencing the great migration in the Serengeti, tracking mountain gorillas in Parc National des Volcans in Rwanda, gliding silently along the Zambezi River viewing wildlife from a canoe, learning desert survival skills from a bushman in Botswana�s Kalahari or sipping champagne while watching the sun descend into the Atlantic from a private balcony in Cape Town, We Know Africa. African Travel, Inc. won distinction as a Top Safari Outfitter in Travel+Leisure's 2012 World's Best Awards, and was nominated by Travel Weekly in their Readers� Choice Awards as a Top Tour Operator and Safari Outfitter.National Geographic includes African Travel in their list of �Best Adventure Travel Companies on Earth,� and African Travel is listed as a Travel + Leisure Family Club Tour Partner. African Travel, Inc. is part of The Travel Corporation, which also includes in the USA Trafalgar, Contiki, Brendan Vacations, Insight Vacations, Red Carnation Hotel Collection, and Uniworld Boutique River Cruise Collection. In Africa, African Travel is proud to have as its sister company Thompsons Africa with its extensive network of offices throughout the region. 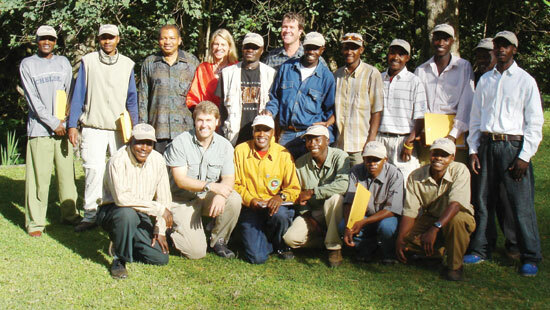 In addition to Thompsons Africa, African Travel works closely with a network of highly rated lodge operators in Africa including Wilderness Safaris.  New luxury hotels changing the face of tourism in Dar es Salaam and Zanzibar.  GOLDEN EUROPE AWARD FOR TTB. How it was achieved. 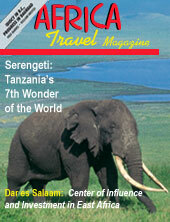  Air Safaris from the Swahili Coast to the National Parks.  Improved access via flights to Dar es Salaam from Newark and Washington, DC.  Air Highways to East Africa - including Tanzania Airlines, Routes and Airports. 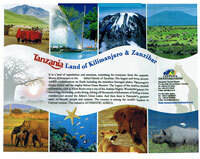  Tanzania's growing connections with Middle and Far East.  Cruise Industry potential for Swahili Coastal seaports.  Major U.S. University Seton Hall holds extended law program in Zanzibar.  Canadian doctors and officials enjoy challenge of Kilimanjaro.  Swahili Cultural, Fashions and Music Festivals. Tanzanians in the Diaspora: Get listed in the Diaspora Database, use e mail address below.